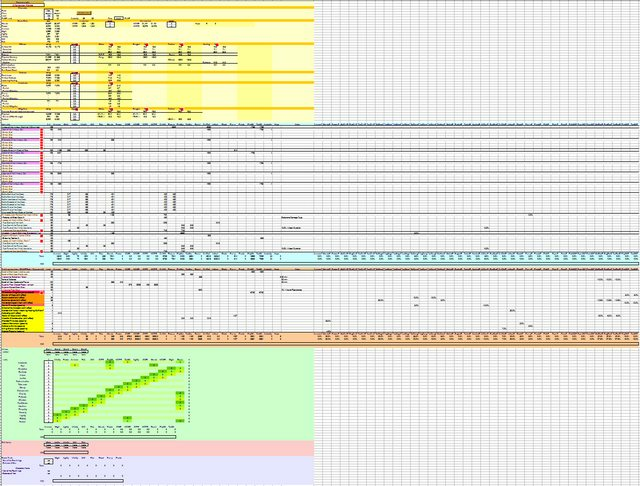 Hi, I would like to introduce you to my planning spreadsheet. It's my first spreadsheet, which I started around the time of the launch of RoR. Through time it has seen many improvements and I have used it a lot privately to plan my captain(s) mainly. 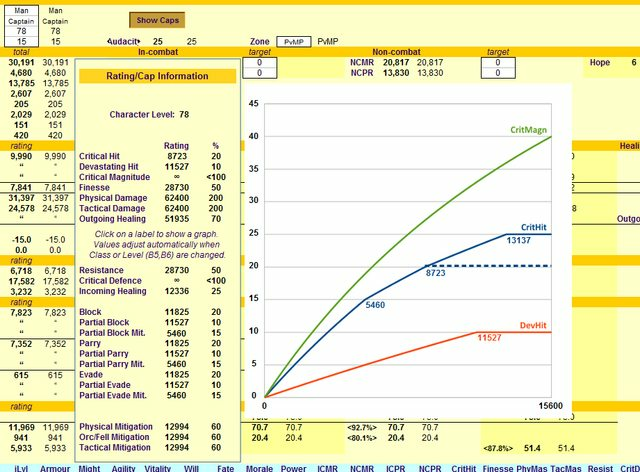 I found it a great tool to optimize my characters and that's why I'd like to share it with you. You can see that everything is looking kinda double. It's two of everything. That's because you want to compare two sets or situations. Your current character like it is now and a new situation, maybe with that item in auction which you can buy or a fully buffed character with food, scrolls, hope tokens whatever. 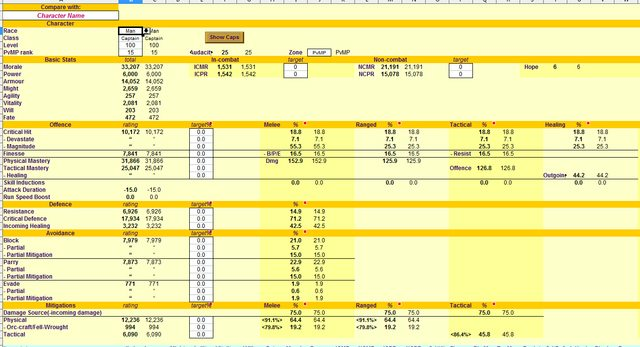 The spreadsheet calculates your stats like inside the game and shows your improvements(green numbers) and/or negative effects (red numbers). It also shows information on cap percentages and the required rating to reach these for any character level. 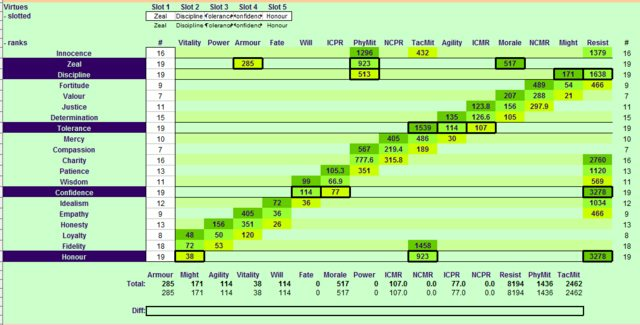 3) All Levels (for instance: see what your critpercentage would be when you level up a few), even past the current level cap. See below for a link to the spreadsheet document in the OpenDocument format (ODS). The spreadsheet works with OpenOffice and LibreOffice, which are free downloadable. The spreadsheet will not work in Excel, because of the macro functions and other differences. - PvMP support: added PvMP rank, Audacity number, zone selection PvE/PvMP. - PvMP: added PvMP sheet with armour, jewelry sets and Ettenmoors effects. - new layout: all target percentages in one column. stats have been split in melee, ranged and tactical confirm Lotro's stat panel. - changed buff/debuff section into skill tree passives/effects section. effects can be found on (and copied from) the effects sheet. - added an effective mitigation percentage based on incoming damage and mitigations. - optimizations (mainly style related. now smaller file size: faster loading). - armour calculations again, because I've linked some more data, but shouldn't have any effect for current itemlevels. - added an opponent level. - contains all T2 Penetration debuffs as displayed in-game. - mitigation calculations by opponent level. - added all 18.2 items. - added essence jewelry selection lists. - added U19 Ithilien items (no purples). - added essence cloak selection list. - added U19.2 essences and gold bracelets. - new selection list functions. - Mordor items refresh: includes new raid sets, new minstrel instruments, new damage/healing relics, etc. Last edited by Giseldah; Mar 23 2018 at 07:12 AM. Last edited by Giseldah; May 24 2014 at 07:47 AM. Last edited by Giseldah; May 24 2014 at 07:48 AM. - some formulas adjusted again. nothing shocking. Extra % to morale in Lotro are not added up, but are all multiplied. 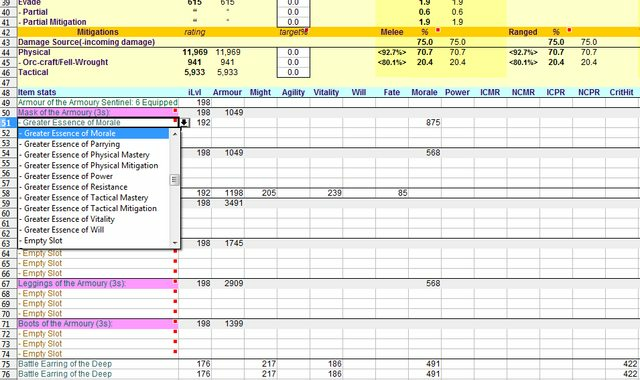 The spreadsheet already has a system for Hope/dread, so you can use that for the Hope %. This version uses the new rating factors which are now on BR (see https://www.lotro.com/forums/showthr...60#post7121760) for the 'new' set 1 in the spreadsheet. So if you keep set 1 & 2 the same then you can see the results of the rating cuts compared to current. Nothing else changed in this version. Note: I didn't check any formulas on BR. Last edited by Giseldah; Aug 14 2014 at 01:05 AM. Last edited by Giseldah; Aug 14 2014 at 01:06 AM. Special version is up to date with last update 13 on BR - p5. 1) Starting with update 13, some mysterious rounding errors(?) are introduced which seem to happen for offense stats. For example, now if you add up all Finesse displayed on your items then chance is that it's not the same as displayed in your stat panel inside the game. I have seen differences of 1-3 points. 2) Some small changes happened to various items. These are not in adjusted in the included item tabs yet. Some changes that I have seen on items(lvl95): 76fate->77fate, higher finesse +1-1.5%. - many changes for update 13. initial release. Complies with update 13, afaik with calculations. I need to check things like stats on food. Last edited by Giseldah; May 24 2014 at 07:49 AM. - added a lot of new Fangorn items, including golden Onodrim armour pieces. Thanks for your work! This is very useful! Indeed, I've used it a lot again recently (like after every update) in update 13 to re-adjust my mitigations and BPE to certain levels. I figured out that for my cappy switching some virtues to Innocence and Mercy + ..Device of Protection relics were my main solution by only calculating it with the spreadsheet. Last edited by Giseldah; May 24 2014 at 07:50 AM. Hi. You have a chance now to play with character levels up to 105. I also added some information lines about maximums which are very useful I think. These are always valid for the entered character levels, even above 95 if nothing changes.. If you don't need them then you can just remove them. Last edited by Giseldah; Jun 04 2014 at 03:42 PM. You should create a web application for this (webpage). Also put in crafting calculators too. Well, it's very easy to use when you have a google account. Just make a copy to your googledrive, which is a cloud kind of thing.. you can go to it with your browser from anywhere without the need to install anything. I don't have the knowledge to create a complicated web something. If anyone wants to do that then it's fine by me when things are used from the spreadsheet, but I don't want to go in that direction. Busy with U14, preparing scalable items. Finished essences lvl100. Need to figure out armour. Last edited by Giseldah; Jun 15 2014 at 07:03 AM. Most of the armour seems to be place-holders at the moment, so I wouldn't worry too much at this point. Also things are likely to change before going live That's why Tulkas doesn't usually get updated until after - it's too much work to keep updating stats on items with each build. That being said, I have added all the essences, but mainly because there are over 300 of them and it's an entire new system which I need to integrate. Point of the scalable items in the picture is that I don't need to enter that many items. In fact, the rare items ilvl 192 were mainly copy/paste with the ilvl changed. They are there for convenience only and appearance. Wow, awesome, thanks. I always wanted something like this. I'm a much more casual player now than I used to be, sometimes taking months off. After I get back, I generally can't remember a thing about what gear or stats I might need next. This will help a lot. yw. I hope it will be useful. Lol I didn't dare to venture in that direction yet. For now only stats and rating/percentages which is in the scope of the spreadsheet. At the moment I'm very busy with calculations of stats on items from iLevels. It's a big job, especially armour which have relations, but didn't discover anything matching, so I have to examine every type individually. Today I found a perfect match (so far) for main stats on items which is separated in a graph of 4 segments with each having a higher rising slope. Last edited by Giseldah; Jun 25 2014 at 05:02 PM.